Sometimes the investment world can be a dripping, sopping rainforest of confusing smells, sights and sounds. Sometimes it can be an absolute swampland of poisonous snakes, treacherous bogs and malaria-carrying mosquitos. And sometimes it can look like a long, long, oh-so-long swath of grassy, deserted plains that just keeps stretching on for miles to see, far away from the peace and quiet of your investment goals. Those can be discouraging, if not downright depressing, to look at. But do you know what can survive like a king in any of those environments? 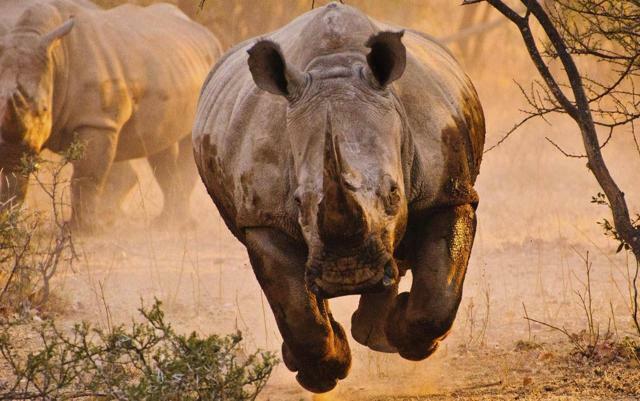 … the rhino is single-minded. When it perceives an object, it makes a decision – to charge. And it puts everything it’s got into that charge. When the charge is over, the object is either flattened or has gone a long way into cover, whereupon the rhino instantly resumes browsing. With last year’s uncomfortable trends and January’s uncomfortable continuation of that volatility, now’s not the time to doubt. It’s not the time to let anything bowl us over. It’s high time to armor up, ignore the swamp around us and make a decision -- to charge straight into real estate investment trusts. And to come out on top when we do. Like rhinos, real estate investment trusts, or REITs, have managed to survive and thrive no matter the market climate. Using risk-aligned practices, they feature sound balance sheets and strong dividend performance. Finding U.S. stocks that offer such solid payouts can be tricky, which is why more and more income-oriented investors are trending toward REITs these days. There’s an intense amount of oversight keeping REITs within those law-abiding boundaries, making them safer portfolio picks still. Plus, they have rhino-like defensive strategies that keep leverage and profitability at the forefront of their business game plans. Just check out their credit rating as proof. Credit ratings aren’t completely infallible, so don’t take them as the end-all be-all of due diligence. It’s important to look at other factors concerning any REIT you’re interested in purchasing too. However, credit ratings are overall worthwhile indicators of risk, value and future growth, so don’t leave home without them. In order to generate the ratings they do, agencies evaluate each REIT based on two main factors. They look at the business risk of its operations (i.e., how unstable its property-based income is) and financial strength (i.e., the particulars of its balance sheet, including leverage and liquidity). From there, they determine whether the company is investment grade or what is commonly referred to as “junk.” Anything designated between AAA and BBB (at least according to the S&P scale) is investment grade. When looking at these assessments, keep in mind that rating agencies rate more than just a REIT’s corporate credit. They also classify its specific debt instruments, since those may offer more or less attractive assets such as mortgage interests in property or certain cash reserve features. Even so, investors interested in purchasing REIT equity shares should focus much more on the corporate side of the equation. Boston Properties (BXP) invests in office buildings and the company maintains a strong balance sheet with conservative leverage position (6.7x— BXP’s Share of Net Debt to BXP’s Share of EBITDAre). The company is improving its leverage ratio and investment capacity through increased EBITDAre from core development deliveries (over $5.1 Billion active and near-term development starts). The shares returned -10.7% in 2018 and we are excited to see strong growth forecasted (+7% FFO per share) in 2019. We are upgrading the company from a HOLD to a BUY. Federal Realty (FRT) is a shopping center REIT that also maintains a fortress balance sheet. In October, Fitch Ratings affirmed Federal Realty’s ratings, including its A- long-term issuer default rating with a stable. Federal Realty’s credit metrics continue to improve: net debt to EBITDA ratio moving lower to 5.4x, down from 5.9x at the start of 2018, the fixed charge coverage ratio is higher: 4.3x versus 3.9x at the start of the year (all Q3-18 data). The company has demonstrated experience at integrating uses such as retail, residential, office, and hotels by developing ~4.6+ million SF and ~2,000 residential units of entitled mixed-use development opportunities within the portfolio. Shares returned -8.1% in 2018 and we maintain a STRONG BUY. Prologis (PLD) is an Industrial REIT with a global platform that enables the company to allocate capital opportunistically and capture a disproportionate share of profitable development opportunities. This REIT has superior rent growth that generates embedded upside from marking current rents in the portfolio. Prologis has significant investment capacity to self-fund without the need to issue equity (it has not issued equity through a follow-on offering or through the ATM since Q1-15). The balance sheet is in excellent shape (Debt as % of Gross Market Cap of 22.5%, Debt / Adjusted-EBITDA of 4.4X, and Fixed Charge Coverage Ratio of 7.2) and over $3.5 billion of liquidity (as of Q3-18). Shares returned -6.0% in 2018 and analysts forecast FFO/share of 4% in 2019. We maintain a BUY. Camden Property (CPT) is a multifamily REIT that owns interests in and operates 159 properties containing 54,480 apartment homes across the U.S. The company focuses on high-growth markets (employment, population, migration) and operates a diverse portfolio of assets (geographical, A/B, urban/suburban). Since 2011, Camden has significantly improved the quality of the portfolio with minimal cash flow dilution, using disposition proceeds to fund development and acquisitions. The balance sheet is healthy -- 4.2x net debt-to-EBITDA, 4.2% weighted average interest rate on all debt, 95.7% fixed-rate debt, and 79.1% unsecured debt) with excellent liquidity ($635M available under $645M unsecured credit facilities. Shares returned -1.0% in 2018 and Camden is forecasted to grow FFO/share by 6% in 2019. We maintain a BUY. Public Storage (PSA) is a leading self-storage REIT and one of the world’s largest owners and operators of self-storage facilities, serving over one million customers. As Rubicon Associates points out “Public Storage has a bulletproof balance sheet, as its debt is all perpetual preferred stock.” The company has four principal businesses: U.S. self-storage, conducted under the Public Storage brand, European self-storage, conducted under the Shurgard brand, commercial properties, conducted under the PS Business Parks, Inc. (PSB) brand and ancillary businesses. Public Storage shares returned 0.70% in 2018 and analysts are forecasting modest growth (2% FFO/share) in 2019. We maintain a BUY as we consider Public Storage to be a brand worth owning. AvalonBay Communities (AVB) is a multifamily REIT with a strong track record of completing development on time and on budget. This S&P 500 company owns communities in leading metro areas such as New England, New York, the Mid-Atlantic, The Pacific Northwest, and Northern and Southern California. The company has maintained a conservative balance sheet (4.9x Net Debt-to-Core EBITDAre, 90% Unencumbered NOI, and 5.2x Fixed Charge Coverage) and strong liquidity ($1.5 billion line of credit). AvalonBay shares returned .90% in 2018 and analysts forecast FFO/share in 2019 of 4%. We maintain a BUY. Simon Property Group (SPG) is a Mall REIT that owns full or partial stakes in 235 Class A malls in North America, Europe, and Asia totaling over 190 million square feet of retail space. About 80% of the company’s net operating income comes from its traditional US malls, which are highly diversified, but nearly all located in dense, thriving, and affluent cities, mostly in Florida, California, and Texas. 20% of its NOI is from its super premium Mills locations and international properties, providing US investors with some nice but safe foreign diversification. Simon has a fortress balance sheet and is able to self-fund growth, today 95.5% of its debt is long-term bonds with an average interest rate of 3.5%. The company has access to revolving credit facilities with over $7 billion in remaining liquidity in case it wants to tap short-term credit markets to fund its growth. Simon shares returned +2.5% in 2018 and analysts forecast the company to grow FFO/share by 3% in 2019. We maintain a STRONG BUY. Equity Residential (EQR) is a multifamily REIT that manages 71,721 apartments (same store portfolio) to maximize revenue by balancing occupancy and rental rate. Since the beginning of 2015, the company has sold approximately 34,000 apartment units for $8.5B generating an unlevered IRR of 12% and returned $4.2B to shareholders in special dividends. The company continues to invest $40M-$60M per year in kitchen and bath renovations which yield a return of 10-15%. The company maintains a strong and flexible balance sheet characterized by low leverage (5.3x Net Debt to Normalized EBITDAre) and excellent liquidity including capacity under its $2.0B revolving line of credit and commercial paper program. Recent upgrades by Moody’s and Fitch brought the senior unsecured debt ratings to A- / A3 / A by S&P, Moody’s and Fitch, respectively. The company maintains a large, diversified unencumbered asset base totaling $22B in un-depreciated book value representing approximately 80% of NOI. Equity Residential shares returned +6.9% in 2018 and analysts forecast 5% FFO/share growth in 2019. We maintain a BUY. PS Business Parks (PSB) owns, operates, acquires and develops commercial properties, primarily multi-tenant flex, office, and industrial parks and is the sole general partner of the Operating Partnership owning 77.8% of the common partnership units (the remaining common partnership units are owned by PSA). The company focuses on owning concentrated business parks which provide the company with the greatest flexibility to meet the needs of its customers (it owns and operates 94 business parks and manages 684,000 rentable square feet). The primary source of leverage in the company’s capital structure is perpetual preferred stock or equivalent preferred units in the Operating Partnership. The primary source of debt the company has historically relied upon to provide short-term capital is its $250.0 million unsecured line of credit. PSB shares returned +7.9% in 2018 and analysts forecast FFO/share of 2% in 2019. We maintain a BUY (on pullback). Realty Income (O), aka “The Monthly Dividend Company” was the top-performing “rhino” in 2018. Over the years, we have maintained a BUY on the company, with the exception of a “trim” around July 2016 when shares topped $70. Realty Income owns over 5,000 free-standing buildings and according to the CEO, the company is “very selective with the properties and tenants (it) invests in.” In 2018 the company sourced approximately $26 billion of investment opportunities while closing on only 6% of that volume. Also last year, Realty Income got a rating upgrade from S&P that placed the REIT in an elite group of only a few US REITs with two ‘A’ ratings. Realty Income’s cost of debt has decreased by ~20-25 basis points since it received the first ‘A’ rating from Moody’s about a year ago, and this has served to further widen the company’s cost of capital advantage (compared with the peers). As predicted, Realty Income announced a dividend increase (of around 4%) earlier this week, signaling that the business model is sound and investors can continue to sleep well at night. Realty Income shares returned +15.2% in 2018 (lifting the ‘DAVOS’ Index that returned 6.3% in 2018) and analysts forecast 5% FFO/share growth in 2019, We maintain a BUY (on pullback).